I love little family owned places like this…they always have the best food! I love little hole places!!!! Dios mio!!! Ahora muero por comer carnitas!!! Qué rico!!! After I posted this, I was craving them, too! Even my mom inquired about when I was going to bring carnitas with me the next time I visit her in the suburbs! Thanks, Tracy. One of the things I love about the place is that the clientele is very diverse. You can see everyone from construction workers to business men stopping in for a taco, eating side by side. ‘Nitas! I hope I get to visit D.F. soon to eat some of these. Do they sell the meat by the pound to go or are they served as tacos? Gabriela, if memory serves me, I believe you can buy both meat by the kilo to go or eat them as tacos at the modest little picnic table they have inside. 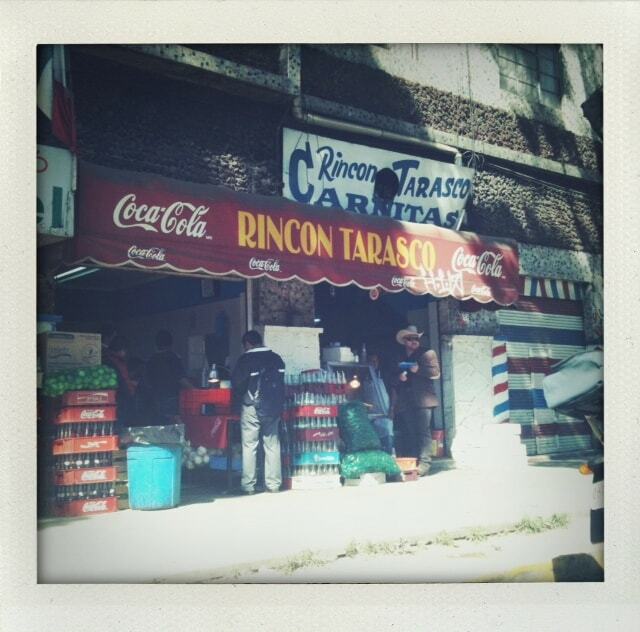 But don’t be fooled by the checkered plastic tablecloths and wobbly stools – the carnitas (and the salsas) here are spectacular!